Che Guevara – Unique Personality who Imprinted His Visage On The Shroud Of Time. Of all those who auditioned for the role of that dark hero of modern tragedy, none played it as memorably on the screen of History as Che. His looks and his ‘Look’ (in the Sartrean sense of ‘the gaze’), the specific aesthetic he constituted, are symbols of the trinity of rebel-hero-martyr. Soren Kierkegaard wrote of two types of heroes: ‘heroes of thought’ and ‘heroes of action’. There are passionate individualist intellectuals, thinkers, writers who stand out from the norm, mountain eagles alighting on lonely crags. There are, on the other hand, those who engage in Herculean or Sisyphean enterprise in the service of a collective cause. Che was a synthesis. The communist experiment issued from the contradictions of Modernity. It always contained the ‘moment’ of the heroic. The most subtle of Marxist thinkers after Antonio Gramsci, Walter Benjamin, remarked in his study of Charles Baudelaire (Che was an avid fan of Baudelaire’s ‘Les Fleurs du Mal’- ‘The Flowers of Evil’) that “the hero is the true subject of modernism. In other words, it takes a heroic constitution to live modernism. That was also Balzac’s opinion”. The communist hero was modernist. “Lenin was from tip to toe a man of the new world. Herein lies his immense uniqueness, herein lies his incommunicable charm” observed Lunacharsky. Che, a hero of late Modernity, was the personification of its traits of unrest, searching, mobility, self-consciousness, intensity and violence. It is difficult, they always say, to imagine Che had he lived until today, but one may safely surmise he would have been like Fredrick Engels, with the latter’s sensibility, his coolly confident and lucidly analytical writing style, his intense interest in the military aspect of international politics (Engels’ nickname was ‘the General’), his Pauline interventions in the international socialist movement. Except for one set of qualities, which Engels didn’t have: Che’s restlessness, his inner tensions, his self-reflexivity, his risk-taking, and the propulsive pressure he subjected himself to: his Messianism. Friedrich Nietzsche critiqued Christianity, the French Revolution and Socialism pointing to their commonality, continuity, contiguity. Others have said that Marxism was a ‘secular religion’ (Raymond Aron), the third great global religion (Regis Debray) following Christianity and Islam. (Hinduism and Buddhism did not spread globally). Marxism shares with these religions, two structural characteristics: ‘the Book’ and ‘martyrdom’. Scholars such as Zbiegniew Brzezinski and Hugh Seton-Watson have gone further and pointed out that the trajectory of Communism is similar to that of the Church: from persecution to power, from slave ideology to state faith, the doctrinal splits, the sects and schisms, the hunt for heresies, the Inquisitions. We for our part can discern, in retrospect, that the Church survived the fratricidal bloodletting but Communism did not, because it was precisely a secular religion. Defeat and failure could not be consoled away by faith in the Almighty or the afterlife. But that alone cannot explain the breadth and depth of Che’s appeal. How is he a symbol outside the Christian civilisational area, outside of the zone of Western cultural influence and ontology? This is because he epitomizes a synthesis that is rare: of Reason and Romanticism, of individual and collective modes, of writer-intellectual and militant man of action. The history of Revolution in general is replete with examples of such human beings, from Tom Paine to Saint-Just and Lenin. Che belonged to this species being. Yet he went one dimension deeper. He was vastly more accessible because he was consciously more transparent—through his writings, particularly his diaries and reminiscences. He communicated more of himself, and thus left more of himself behind. The only other example in modern times of the intimacy of the intellectual hero is T.E. Lawrence’s ‘Seven Pillars of Wisdom’. But Lawrence reveals his disgust at the manipulative imperial power politics of his bosses, while Che was fighting for a cause that was purer in conception, while he himself could not be and was not being manipulated by anyone. The history of philosophy is parsimonious in the extreme in the endorsement of real individuals. Philosophers rarely identify persons, still less exalt them. The exceptions are legendary. With Plato, it was of course Socrates. With Hegel, it was Napoleon, the world-spirit concentrated in a man astride a white steed, reviewing his troops after the Battle of Jena. With Nietzsche it was himself, thinly disguised at first as the fictional Zarathusthra. For Jean Paul Sartre, the existential hero was for the most part represented by his fictional and dramatic characters, as was the case for Camus and his doctrine of Absurdity. But Sartre, arguably the most influential of post-war philosophers, would make a significant exception, for one man. Che. After his several weeks long visit to Cuba, and the conversations that he and Simone De Beauvoir had with Guevara, Sartre famously called him ‘the most complete man of his time’. By ‘complete’ we could say that Sartre did not mean it primarily in the sense of a Renaissance man who was complete by virtue of being a well-rounded personality of broad culture, encyclopaedic mind and strong physique. Of this type, Marx and Engels were the modern exemplars. By ‘complete’, it is more apposite to appreciate the creative effort and task involved, a labour both productive and aesthetic, the struggle of producing something — including a work of art (and here I echo Haydee Santamaria speaking of Che). Che was the most complete man of his time in the sense that his personality, his individuality and consciousness, were the most advanced, therefore the most completed, of all the men of his age. Che was fashioned by Che himself, in the Sartrean existential sense: by his choices and projects. Che was the ‘Higher Man’— to use Nietzsche’s term — of the Age of Socialism and Revolution. Nietzsche said that ‘Man is something to be overcome’. Che felt that bourgeois man, man in the bourgeois and petty-bourgeois senses of the term, the man of the old society, was something to be overcome — and replaced by the New Man. For Nietzsche, the striving should be to create the ‘higher man’ (incorrectly rendered as ‘Superman’ and horrendously identified with Nazism by conventional prejudice, from which he has fairly recently been rescued.) However Nietzsche’s ‘Higher Man’ would achieve his status by means of an individual project, though a turbulent, tempestuous one. Che’s New Man, which he strove to convert himself into, was the product of immersion in a collective project. Che reconciled in his own person that which often is irreconcilable — the polarities of a developed individuality on the one hand and identification and active engagement with a collective project, on the other. In his ‘Man and Socialism in Cuba’ Che argued that it is precisely by such an identification and involvement (which strikes this reader as analogous to the Kierkegaardian ‘leap’) that it was possible to attain the highest form of the individual personality. And this postulate he proved in practice. Can we find in the whole of the twentieth century, another individual who sought to inhabit the ‘extreme situation’ and the ‘limit experience’, as much this man who fought and died for a collective-universalist cause and followed a profoundly social ideology? Can we point to an individual personality produced by the philosophies and doctrines of pure individualism, a personality even in literature, who was more indelibly etched, more interesting, more difficult and dramatic than Che? Che’s writings are cinematic: part camera, part script. Though not published in chronological sequence, we can now apprehend the texts serially – the Motorcycle Diaries of his trip through Latin America, the Central American Diaries with its mention of his encounter with Fidel and the Cubans, his various reminiscences of the Cuban Revolutionary war, the lacerating Congo chronicles, the almost unreadable tragic pathos of the unfinished Bolivian Diary. His distinctive mode was literary/visual. The writings must be taken together with the photographs: Che was the most photogenic – and therefore the most photographed and graphically portrayed — political personality of the 20th century. All these texts and photographs constituted but illustrated chapters of one autobiographical narrative, with its inner/outer dimensions, the last pages written in blood by his agony and death. In his end was his beginning: the Bolivian Diary reaches us with a long introduction and the text of the Periclean valedictory oration by Fidel. Che chronicled his attempt to change the world and therefore his change in himself — which is what made him so accessible to a whole generation of post-war youth, westernised, modernised, and rebellious, both in the West and the Third World. It must be admitted that three other factors played their part. His looks, perhaps not handsome in the strictly conventional clean-cut sense, but utterly striking. His manner and personality as exhibited in his writing, with its contemporaneity of temper: the rare combination of intensity and irreverence, of self-driven velocity and self-deprecatory wit. Then, the subliminal impact of his visual resemblance to representations of Jesus Christ, capped by the parallel trajectories of Che’s end-time in the Yuro ravine and Vallegrande and the forced march a millennium ago, to Golgotha, the Place of the Skull. We witness Che in a way that we cannot any other leading politico-historical personality. We are drawn into the evolution of his consciousness and character, and finally, in the Congo Diaries and the Bolivian Diaries we witness the torment in his soul. 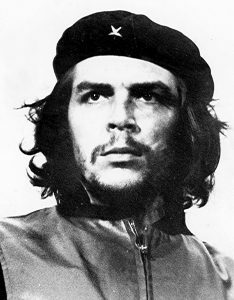 Che simultaneously acts, records and reveals the dramatic context, trajectory and destiny of his protagonist: Che himself. Every year one reads Che, one can see more deeply into him. I now wonder whether the dialogue in the darkness between the oracular old revolutionary exile and young Ernesto, the undated ‘Afterthought’ of the Motorcycle Diaries (1952), is a conversation between Che and himself. I wonder whether it led to his decision fifteen years later that it was ‘the right time’—the ‘Kairos’, the Greeks called it – for the necessary, inevitable sacrifice. We can also understand how Che made the fateful decision to engage in a long march away from his camp in Nancahuazu in Bolivia, a march from which he would never return to base. It was a direct consequence of a mistake or worse still a (perceived) weakness that he never forgave himself for, made in the Congo, where he did not range away from the shores of Lake Tanganyika. We can also understand his insistence on being the sole politico-military commander of the guerrilla enterprise in Bolivia. It was not only part of his theory and his ego. It was part of his strategy: the very fact of his leadership, he thought, would give a qualitative edge to the struggle. More than all these, it was reaction to the bitter disaster in the Congo. Che had been dependent on the decisions and conduct of personalities far less brave, intelligent and committed than he; a situation very different from his Cuban experience where he fought under the command of Fidel Castro, a man whose superior ability to lead he never doubted— and with good reason! Ernesto Guevara de la Serna was a non-conformist young Latin American. Brilliantly clever, penetratingly discerning, hungry for adventure and experience, with a bent for research and considerable academic prospects, charmingly rascally, utter frank and irreverent; a picaresque modern rebel a la Stendhal’s Julien Sorel. What turned this talented writer (‘the title of writer is the most sacred thing in the world’ he would say as a mature leader), doctor, medical researcher, drifter, iconoclastic political critic and rebel into the iconic revolutionary? What turned Ernesto into Che? A confluence of factors: the behaviour of the United States in Latin America — chiefly its violent counter-revolutionary conspiracy in Guatemala — and the cynical depredations committed by it throughout Asia and Africa, an outraged Latin American nationalism, a sense of social justice and a sensitivity to the plight of the people, the enormously compulsive attraction of Marxism-Leninism for a brilliant mind and strong rebellious temperament, intense curiosity about the historic experiment going on in the Soviet Union and China. But none of these factors in isolation, nor all of them taken together, were sufficient to commit Che firmly to the path that he chose. Though one part of him envisaged a future as a revolutionary combatant (there is an apocalyptic vision of this in his first, most beatnik jottings, the Motorcycle Diaries), the other part of him saw himself in Europe, the Western world (Paris, New York), China— travelling, writing, researching. What then turned Ernesto Guevara—”eclectic dissector of doctrines and psychoanalyst of dogmas” as he described himself at 24—into Che rather than into a Hispanic Hemingway, Malraux, a Louis Althusser or Charles Bettelheim? Paradoxically, the Guevarist stance was possible because of Communism and its crisis. Che was the Silver Surfer on the tidal wave of socialist revolution, its most ‘avant-guard’ personality: if anyone personified the Communist category of ‘vanguard’ it was he. On the other hand, if not for the fact of de-Stalinization (which he rightly criticized) and the Sino-Soviet split (which he lamented and tried to step into the breach of) the space would not have opened for the critical-creative individual expression that was Che: Byronic hero, self-steeled by Bolshevism. For Che’s emergence and role, a rent in the curtain of the Temple of dogmatism was necessary. Che’s Marxism was like him. It was rigorous, yet open and non-dogmatic; creative yet committed. An admirer and strong supporter of Stalin (this is amply documented) with a laconic disregard for Trotskyism, he also read Trotsky. He envisaged a destiny for Marxism as part of general social and political scientific thought: a post-Marxist Marxism, as it were. Perhaps this ‘Pascalian wager’ that Che makes for Marxism will pay off, but in the meantime, he has himself achieved that destiny of assimilation into the human consciousness that he anticipates for Marxism. Che’s image and attitude have become part of the modern experience, part of the culture and consciousness not only of the twentieth century but also of the meta-narrative of Man, the Rebel. If a psychological history of the generations of the post-war world were to be written, the dividing line would run between those who were moved, who felt something when they saw and see Korda’s picture of Che, and those to whom it meant nothing; those to whom Che was and is a hero; and those to whom he is a matter of indifference or a mere curiosity. Two different outlooks, sensibilities, attitudes. The Spanish existentialist critic, writer and philosopher Miguel de Unamuno, writing a few years after Nietzsche, commended a spirit that would be ‘at war in peace’ and ‘at peace in war’. Che Guevara was such a spirit. For Heraclitus, the founding father of dialectics, fire was the quintessential source and symbol. Che was a cold fire, which had concentrated itself. A uniquely individual personality, he harnessed himself to History and in doing so stood out against its backdrop, imprinting his visage on the shroud of time. « “Aekiya Raajya – Orumiththa Naadu”: For An Undivided, Indivisible Sri Lanka.